The author, a doctor and IT professional, harnesses his two decades of experience to characterize the hazards that health technology can introduce. Risk can never be eliminated but by drawing on lessons from other safety-critical industries the book systematically sets out how clinical risk can be strategically controlled. The book proposes the employment of a Safety Case to articulate and justify residual risk so that not only is risk proactively managed but it is seen to be managed. These simple techniques drive product quality and allow a technology's benefits to be realized without compromising patient safety. Illustrations note 2 Illustrations, color; 6 Illustrations, black and white; XVIII, 305 p. 8 illus., 2 illus. in color. This book provides practical guidance regarding the safe manufacture and implementation of health information technology (IT), consolidating what has been learnt in the industry over the last 10-15 years. Healthcare professionals are increasingly reliant on IT to deliver care and inform their clinical decision making. Health IT provides enormous benefits in efficiency, communication and decision making. However a number of high-profile UK and US studies have concluded that when health IT is poorly designed or sub-optimally implemented, patient safety can be compromised. As a result, manufacturers and healthcare organizations are increasingly required to demonstrate that their health IT solutions are proactively assured. 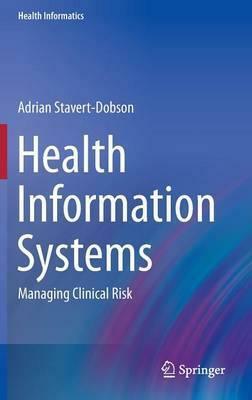 Health Information Systems: Managing Clinical Risk provides essential supporting material to professionals involved in creating or implementing health IT and is the perfect companion for programme managers, clinicians, designers, risk managers, and IT staff. Introduction.- Standards and Quality Management in Health IT.- The Nature of Risk and Safety.- Acceptability and Ownership of Risk.- The Safety Management System.- Undertaking a Clinical Risk Management Project.- The Scope of Clinical Risk Management.- The Hazardous Environment.- Failure of Health IT.- A Framework for Hazards in Health IT Systems.- Structuring the Hazard Register.- Populating the Hazard Register.- Estimating and Evaluating Clinical Risk.- Developing Control Strategies.- Software Testing in Clinical Risk Management.- Gathering Evidence for the Safety Case.- Developing the Safety Case.- Handling Faults in Live Service.- The Safety Case in Live Service.- Availability and Performance.- Evidencing Competency.- Language and Writing Style. Adrian Stavert-Dobson is a medical doctor, computer programmer and health informatician. He successfully developed his first eHealth solution aged just 18 and went on to study Medicine at the University of Leicester. His passion for technology took him from clinical practice in anesthetics to full-time Hhealth IT working with a number of innovative software suppliers in the UK and abroad. A strong advocate for patient safety, Adrian has specialized in the management of clinical risk in Health IT systems. Working alongside professional safety engineers he has adapted techniques well-established in other safety critical industries to the healthcare domain.